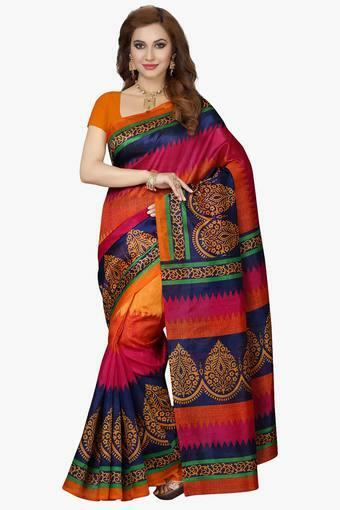 Dazzle like a diva in this bhagalpuri silk saree. It comes with a mix of contemporary floral motifs across a bright base. The amalgamation of different hues creates a dramatic look. You can wear it on any casual occasion and flaunt a fresh style statement. Add a dash of vibrancy to your ethnic wear collection with this saree from Ishin. Pair it with a matching blouse and sleek jewellery to complete your look.